Clarksville, TN – On December 23rd, 2017 around noon, Clarksville Police received a road rage complaint about a man in a pickup truck that followed a car, with a family of five, from Paris Landing Bridge all the way to Clarksville. The driver of the pickup, later identified as Herbert Barry Clark, was behind their car flashing his headlights and making hand gestures for them to pull over which placed the family in fear for their personal safety. 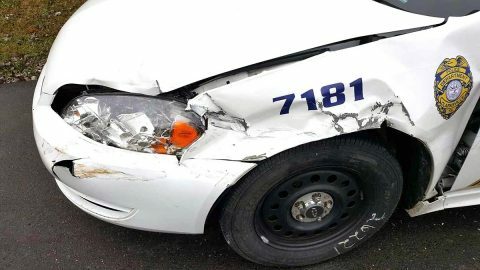 Clarksville Police Patrol Car that was hit by Herbert Clark when he fled from Police.